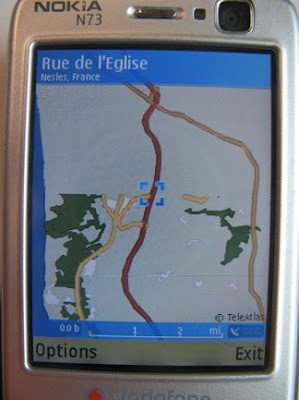 Following my previous adventures with Nokia Maps involving some basic things like loading maps, and using the advertised bluetooth, I (eventually) got France downloaded to the 2Gb card in my N73, because we were getting the ferry to Calais and then driving to the Bayeux area. To the best of my knowledge Calais is in France. So what happens to the hi-res maps of France north of Boulogne? They stop thahts what. When we got off the ferry at Calais at the default zoom there was nothing, so we had to revert to 20th century navigation ie paper maps. 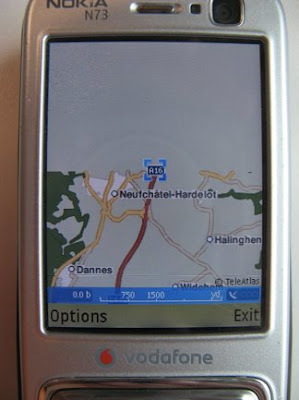 Abo ut 30 minutes later I tried again, and this time all is working OK. After investigating it seems the Nokia France map is missing quite a lot of Northern France, and worse at certain zooms levels shows nothing. Of course I know this whole thing is (mostly) free, but whats the point. And what if you paid the subscrition?